NETWORK UPDATE: The season finale of SECRETS & LIES gained 0.1 in final numbers, making it ABC’s highest rated show of the night. In addition, FAMILY GUY gained 0.1. CABLE HIGHLIGHTS: HBO’s GAME OF THRONES was of course at the top of Sunday cable, up 0.o9 from last week to 3.56. SILICON VALLEY slipped 0.06 to 1.03, VEEP was down 0.02 to 0.50, and LAST WEEK TONIGHT gained 0.07 to 0.71. The season premiere of PENNY DREADFUL on Showtime was unimpressive at 0.22, down 0.17 from last year’s series premiere and down 0.11 from the Season 1 finale. 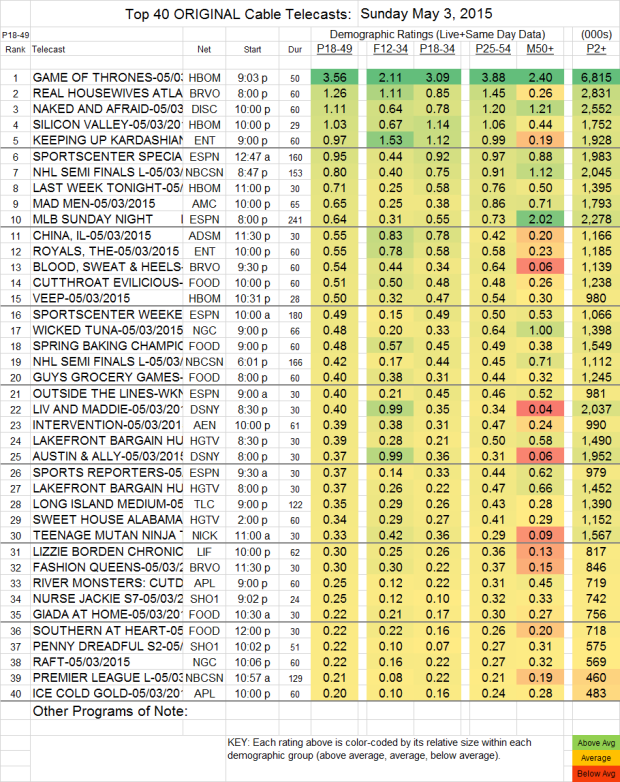 The 2d week of HAPPYISH climbed 0.04 to 0.10, although it was much flatter in total viewers, up 5000 to 237K. NURSE JACKIE rose 0.07 to 0.25. MAD MEN (AMC) gained 0.04 to 0.65. On Bravo, REAL HOUSEWIVES OF ATLANTA lost 0.30 to 1.26, while BLOOD, SWEAT & HEELS gained 0.08 to 0.54 and FASHION QUEENS was up 0.06 to 0.30. On E!, KEEPING UP WITH THE KARDASHIANS shed 0.03 to 0.97, and THE ROYALS was up 0.03 to 0.55. NAKED AND AFRAID (Discovery) added 0.11 to 1.11. Adult Swim’s CHINA IL dropped 0.13 to 0.55. Lifetime’s LIZZIE BORDEN CHRONICLES gained 0.06 to 0.30. SALEM (WGN America) burned off 0.02 to 0.10.